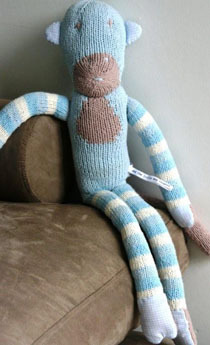 Mooki is a knitted light blue/dark blue monkey with fabric trim and knitted bag. Each toy from the Little Dog line has its own personality. Mooki's introductory tag reads: 'I love to giggle and make mudpies in the rain...' Don't be surprised if he becomes your son's favourite travelling buddy.